We’ve run into so many people who already have Allstays Camp and RV, that we won’t spend much time telling you all the details. Suffice it to say, if you travel the USA or Canada, and you camp or RV, this is a Must Have App! It has a price tag of $9.99 – and it is well worth it! You can visit the Allstays website and search all the campground listings for free, but if you want to be able to look at your iPhone, iPad, or Android phone or tablet and find the best place to park, where you are, the Allstays Camp and RV app is the way to go. Allstays has it all! 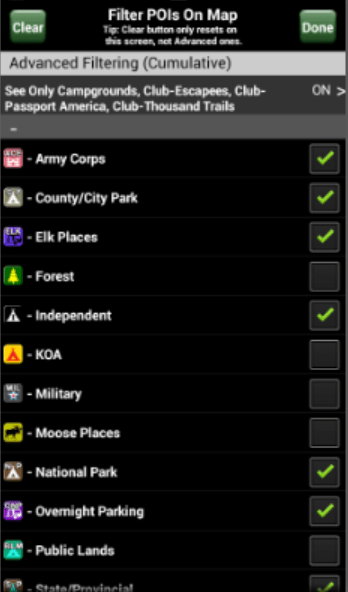 Notice this screenshot where you can specify that you want to see Army Corps of Engineer parks, County/City Parks, even Elks Lodges. And this screen is just the basic list, there is also the advanced filter where I’ve asked for Escapees, Passport America, and Thousand Trails parks specifically. It will show you Walmarts, Cracker Barrels, Truck Stops, and Rest Areas. This is my go-to App whenever we need a place to park the RV. If Allstays can’t find you a place to park, you’re in trouble! Once you’ve located a park, just a tap will open up the detailed information about that park. You can see their amenities and read reviews. If you’re using it on your phone, a simple tap on the phone number will dial for you and you can make a reservation. Once you’ve decided to go there, another tap on the directions link and up pops your map and turn by turn directions to get you there. If you haven’t ever used your phone (or tablet) for navigation, be sure to watch our member tutorial video: Google Maps: Navigating with Android or iPad. Published by MrsGeek, in Blog. Tagged with Allstays Camp and RV, Must Have Apps.